All three are solidly constructed and easily secured to the beater shaft with a simple twist. The bowl itself locks tight to the base. Standing about 15 inches high, jutting out a foot, and weighing more than a grown woman's bowling ball, this stand mixer isn't the sort of appliance you'll wipe down and put away. Better to find a square foot of free counter space for easy access; besides, this machine is as pretty as it is rugged. 325-watt mixer with 10 speeds; 5-quart stainless steel bowl. Tilt-back head for easy access to mixture. Includes flat beater, dough hook, and wire whip; pouring shield not included. Measures 14 by 8-2/3 inches by 14 inches. Included accessories: Flat beater, dough hook, wire whip, and power hub. ATTENTION ALL CUSTOMERS: ALL ELECTRONIC ITEMS ARE 110V. 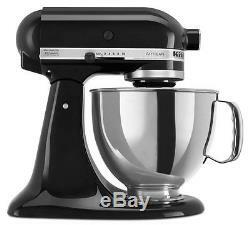 The item "KitchenAid RRK150ob Black 5-quart Artisan Stand Mixer (Refurbished) RRK150OB" is in sale since Friday, November 21, 2014.